A simple demonstration system can be created with the standard version because the upper I/F is provided with the standard version. The simple version indicates the authentication status by sound and LED. This kit lets you experience electric field communication (BAN). The tag you are carrying, the electrode you touch, and the reader/writer communicate using the electric field around you as the medium. Data can be read from or written to the tag you are carrying via a personal computer Aufblasbare Spielzeuge. Size (W x L x D): CF size (38 x 44 x 4.2 mm) The shape can be customized. Supply current: 120 mA, max. *2: Number of tags that simultaneously communicate via one reader panel. The overall number of tags per system is not limited. 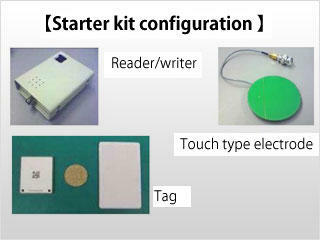 The starter kit includes a tag, electrode, and reader. It is recommended for those who wish to experience electric field communication (BAN). It can also be used for demonstrations within your company. A simple version that is not connected to a PC is also available. For details, consult Ad-Sol Nissin.